The Democratic Republic of the Congo is grappling with one of the largest and most complex humanitarian crises in the world. Due to an intensification of conflict, the number of people in need of humanitarian assistance in 2018 increased from 7.3 million to 8.5 million. This number is projected to reach 13.1 million in 2019. The Kasai crisis affects five provinces (Kasai, Kasai Central, Kasai Oriental, Lomami and Sankuru). At the height of the crisis, the number of internally displaced people (IDPs) reached 1.4 million. Violence has led to an increase in acute food insecurity across the Kasai region and will compromise the food security situation for 2018. Access to health services remains a challenge, only 74% of the country is covered by primary health care (PHC), and 64% by hospital services. It is anticipated that the level of morbidity and mortality for all diseases will increase significantly in the immediate future due to the lack of access to health services compounded with the deteriorating living conditions, violence and ongoing displacement. In addition, the Democratic Republic of the Congo is constantly faced with multiple disease outbreaks, including prolonged cholera outbreaks, Ebola, yellow fever and measles. The deteriorating humanitarian situation has resulted in the disruption of vaccination campaigns in many locations. Malaria remains the leading cause of death, notably among children. In response to the deteriorating crisis this year, Africa Health Organization (AHO) has surged additional technical expertise in the field of coordination, surveillance, case management, social mobilization and water, sanitation and hygiene (WASH). Through its sub-offices, AHO provides technical and field operational support for disease surveillance and response. Such support includes the verification, harmonization, compilation and reporting of surveillance data, as well as verification of alerts reported by the community. AHO is providing technical and operational support for coordination to the Ministry of Public Health (MOPH) and partners. This has led to a more streamlined response, preventing duplication and enabling timely identification of resource gaps and unmet needs in the field. AHO works with partners to deliver health services to the displaced population and their vulnerable host communities. In 2018, the response by AHO and the health sector to the ongoing complex emergency in the Democratic Republic of the Congo remains focused on reducing excess mortality and excess morbidity of people affected by the crisis, as well as contributing to the resilience and strengthening of the national health system. The response is anchored within AHO’s long-term emergency management objective. Strengthening coordination of the health sector, within the MOPH platform and the humanitarian system. In order to serve the vulnerable and protect public health, AHO requires funding of US$ 50 million. To date, the health sector remains chronically underfunded. For over two decades, the Democratic Republic of the Congo has faced one of the largest and most complex humanitarian crises in the world. In 2017, this situation has dramatically deteriorated, most notably in the greater Kasai region, the Kivu region, and Tanganyika province. A surge in violent conflict and intercommunal tensions has had an impact on people in areas previously considered stable, and stretched the coping mechanisms of people in areas already affected. It forced more than 1.7 million people to flee their homes in 2017 – an average of over 5500 people per day. By January 2018, the total number of internally displaced people in the Democratic Republic of the Congo had reached 4.5 million, which is the highest number of any country on the African continent. Across the country, at least 8.5 million people were in need of humanitarian assistance and protection by the end of 2017. 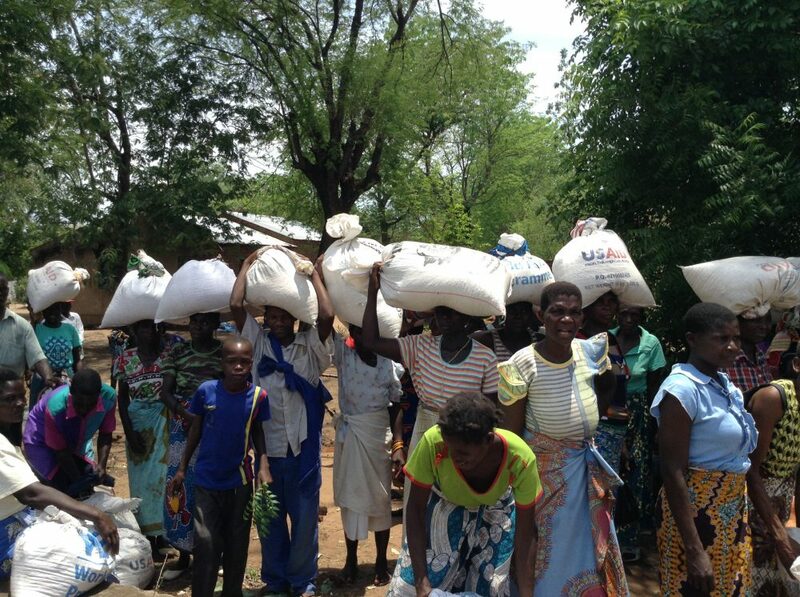 Humanitarian partners estimate that in 2018 this number will increase by almost 5 million, and that 13.1 million Congolese, out of an estimated total population of 94 million individuals, will require humanitarian assistance and protection as a result of the heightened violence in hotspots across the country and the already precarious food security situation. Close to 2 million children are projected to be affected by severe acute malnutrition (SAM) in the coming year4, based on the latest integrated food security phase classification analysis (IPC). Population movement – including the 4.5 million people internally displaced and some 600 000 refugees from South Sudan, Central African Republic and Burundi – generated over half of the humanitarian needs. Furthermore, approximately half a million Congolese have sought refuge in neighbouring countries. Along with continued displacement, there have been a significant number of returns to the Kasai region, where basic services have become non-existent as a result of the conflict.6 The lack of capacity to support these returnees presents a significant risk of a vicious circle of displacements and inter-community violence. Returnees, unable to survive in their places of return, will be pushed to leave once again; on the other hand, vulnerable communities receiving returnees will need to compete more intensely for basic resources, triggering violence. From the first to the last Epi week of 2017, the city of Kinshasa notified 697 cases of cholera, with 53 deaths (case fatality rate/ CFR 7.6%). The number of cases reported from Kinshasa started to increase in Epi week 47, at the beginning of November. This increase was first reported in the health zone of Binza Météo. The outbreak eventually spread to 21 of the 35 HZ, as a result of intensive rain and consequent flooding. From November 2017 to 11 January 2018, 531 cases were recorded from 12 health zones, with 32 deaths (a CFR of 6%). Considering Kinshasa’s high population density and its status as a major transportation hub, compounded with its poor water and sanitation status, WHO’s rapid risk assessment of the outbreak in Kinshasa categorized the risk of internal spread of cholera as very high.8 Spread from Kinshasa may rapidly re-ignite outbreaks along the Congo River and beyond, in provinces that have reported a decreasing trend of cholera in recent months. Neighbouring countries have historically experienced outbreaks of cholera following exportation of the disease from the Democratic Republic of the Congo. With Kinshasa situated on the banks of the Congo River, just a few kilometres from Brazzaville in the Republic of Congo, the risk of regional spread is considered to be high. However, the risk of global spread is deemed to be low. Measles outbreaks are also recurrent in the Democratic Republic of the Congo. Despite past successes in bringing measles outbreaks to an end, the deteriorating humanitarian situation in the country has resulted in the interruption of routine vaccination in many locations. Compounded by malnutrition and poor water and sanitation, the number of reported measles cases steadily increased in 2017, reaching 45,147 cases and 535 deaths from January 2017. The Ebola virus disease (EVD) outbreak is confirmed in DRC in 2019. As of 19 February 2019, 848 EVD cases2 (783 confirmed and 65 probable) have been reported, of which 57% (485) were female and 30% (258) were children aged less than 18 years. Cumulatively, cases have been reported from 119 of 301 health areas across 19 health zones. Ongoing cleaning of case databases this past week corrected to the number of deaths and survivors discharged from Ebola Treatment Centres (ETCs) thus far; overall 529 deaths (case fatality ratio: 62%) and 257 survivors have been reported to date. Objective 3: To strengthen coordination, information management and health system restoration leading to improved service delivery with focus on enhancing protection and increased access to health care.